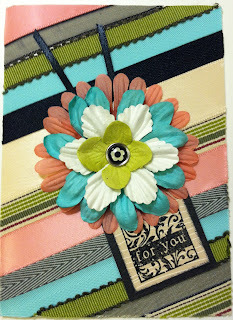 Today I want to share a quick card that I made with scrap ribbon. I tend to keep every little piece of everything and recently decided that enough was enough. I looked at my container that holds my small scrap ribbon and if I couldn't make a nice bow I was getting rid of it. Looking at the pile of ribbon, I decided to make a card. Taking an A2 card base, I ran it through my trusty Xyron machine and now having a totally adhesive card front I applied the ribbon in a diagonal design. With sharp scissor I trimmed the ribbon around the card. Adding several layered paper flowers, a small brad in the center and a sentiment tag the card is complete. BRILLIANT idea, Nancy! I love it. Now what are you going to do with the ribbon scraps you cut from the edges of the card?!? Tee hee!